As summer draws to an end in Ohio, canning season is in full swing, giving us a way to enjoy the fresh taste of homegrown produce year round. September is the perfect time to preserve Ohio-grown sweet corn, peaches, pears, and applesauce. Late-harvest tomatoes are also a popular September canning item, yielding savory pasta sauces as well as tomatoes and tomato juice for soups and stews. While home canning is a rewarding process, it can be taxing on your kitchen if precautions aren’t taken. Here are some tips to help you preserve your kitchen. Glass or ceramic stovetops may not be suitable to use with canners, especially pressure canners, so it is always a good idea to check your owner’s manual or contact the manufacturer before you start canning. Coil burners are generally safe to use for any type of canning, but it is still a good idea to check the owner’s manual for specifics about your model. Some glass-top units are built with a sensor that automatically shuts the burners off if they get too hot — a feature that prevents potential cracking or damage. Glass-top burners may also fluctuate temperature continuously in order to maintain the desired heat without overheating. When using pressure canners, either of these scenarios can present an inconsistent pressure problem, resulting in undercooked and potentially unsafe food. If you learn that your glass-top stove is safe to use for canning, keep in mind that many glass-top stoves have a weight limit, so excessive weight in the canner could cause damage to your stove top. Also, canners that are full and heavy can easily scratch a glass surface, so avoid sliding or dragging canners across the surface. Heat damage While surfaces such as granite, marble, quartz, and stainless steel are more heat resistant than laminate, they are not completely heat proof. Care should be taken with all countertops during and after canning to protect against heat damage. If you plan to use your countertops to store canned jars as they cool, use racks, towels, hot pads, or trivets to protect the surface. Even heat-resistant countertops can crack under extreme thermal pressure, and laminate surfaces can melt, warp, or become discolored. With any surface, it is best not to place hot pots and pans directly on countertops without protection. Not only can pots and pans cause heat damage, but the bottoms can scratch many surfaces. Etching and stains In canning, vinegar is a must for pickling, and lemon juice is often added to jams, fruit, and even tomatoes, depending on the recipe. On any surface, care should be taken to clean up these acidic liquids right away. Acids can etch and stain surfaces such as marble, and can soak into and stain granite or quartz if left on the surface too long. Laminate countertops stand up well to acidic liquids, but juices from tomatoes or grapes can stain a lighter surface. Scratching One of the most laborious tasks in the canning process is the prep work, which often involves chopping or cutting fruits and vegetables before canning. While surfaces such as quartz and granite are scratch resistant, cutting directly on those surfaces can dull knifes. Marble, laminate, and solid surface are prone to scratching. No matter the surface, it is always best to use a cutting board to protect countertops from scratches and even stains from certain fruits or vegetables. 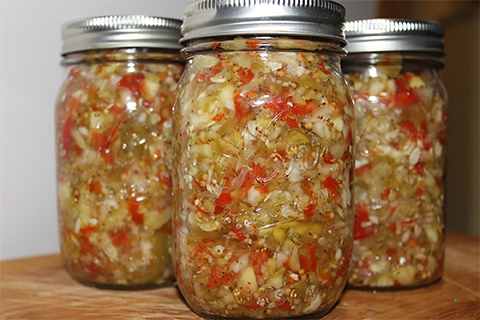 The canning process can leave any kitchen hot, humid, and generally uncomfortable to work in. Extreme humidity can cause damage to wood surfaces such as cabinets, especially if they are close to the stovetop where you are canning. Cabinets that have a laminated outer surface—or are painted—can bubble or peel when exposed to steam or moisture for long periods of time. While you may not see noticeable damage to surfaces right away, if you can multiple times a year, year after year, eventually you may see the effects. Control the humidity in your kitchen by running your range vent throughout the process. If the temperature and humidity outside is lower than inside (one of the many benefits of fall), consider opening your windows. Otherwise, running your air conditioner will help regulate the humidity and keep you comfortable throughout the process. Canning is hard work, but the rewards far outweigh the investment of time upfront. If you are an avid canner who is considering a kitchen remodel, Lutes Custom Cabinetry and Furniture can help you choose the best options for your kitchen!